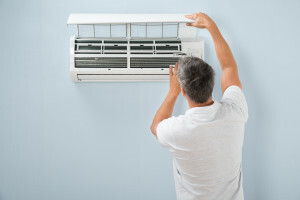 Your air conditioner should receive yearly maintenance. This service should include thorough cleaning and inspection of all parts of the unit, both indoors and outdoors. A unit that goes without service loses about 5 percent of its efficiency each year. By having a professional perform regular maintenance, you improve efficiency and ensure any problems are caught before they cause more expensive issues. Be sure the maintenance provider replaces air filters if necessary, checks all of the ductwork and checks for leaks. If you think there may be a serious problem with your unit, don’t put off air conditioner repair. The longer you wait to have it looked at, the more serious the issue will become. If you wait too long, it may become unfixable. It will be much more expensive if you have to replace the entire unit instead of repairing it. Serious issues include finding leaks in the unit, smelling a strange odor when the unit is running or not blowing air at all. Sometimes a unit must be replaced regardless of how it works. Units that are older than 10 years are not made to be as energy efficient as newer models are. If you replace old units, you could save several hundred dollars per year on your utility bill, depending on how old the unit was. It will also raise the value of your home if you are planning to sell. 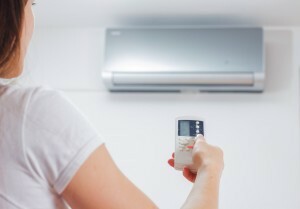 Don’t put off air conditioner repair when you really need it. Make your home comfortable again before the situation becomes more expensive by hiring a professional HVAC repairman. If you are looking for air conditioning maintenance in, please call Weidner Energy Savers today! Installation costs for air conditioning in Pennside typically runs anywhere from $2,000 to $10,000. These numbers can vary greatly depending on the size of your home and which features you choose to install. If you are installing an energy efficient HVAC system, make sure you research any federal or local rebates. These can save you hundreds of dollars, some rebates going into the thousands. Air conditioning in Pennside requires regular maintenance to run at maximum efficiency. The good news is, the costs of maintenance, especially if performed preventatively, is very reasonable. Basic maintenance tasks you can perform on your own include cleaning or replacing the filter, which should be done on a bimonthly basis. A permanent electrostatic filters can be washed and reused, and if cared for properly will last between five and ten years. This alone can lower your air conditioner’s energy consumption by five to fifteen percent. Other maintenance tasks for your air conditioning in Pennside include keeping a two-foot clearance around any outdoor HVAC units and clearing any leaves and debris which have collected in your unit on a monthly basis. It is especially important to ensure that your air conditioning unit is operating at its peak efficiency before the summer season begins. Hiring a certified HVAC technician for a basic tune up can help ensure you stay cool during the sweltering summer heat. You can decrease the workload on your air conditioning in Pennside even further by keeping your windows sealed and covered. Up to 30 percent of unwanted heat comes from your windows. Simply closing your blinds and curtains can reduce your indoor temperature by up to 20 degrees and save nearly 10 percent in electricity cooling costs. Whether you are installing a new unit, or trying to get the most out of your preexisting air conditioning in Pennside, maintenance is crucial. Keeping your unit healthy will maximize its energy efficiency as well as its overall longevity. 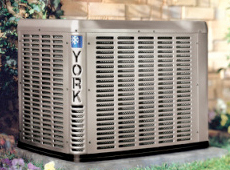 Need Your Air Conditioner Repaired in Pennside? Call Today! 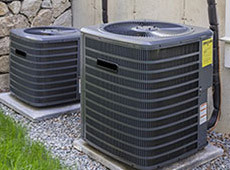 Our full service air conditioner repair and air conditioner installation needs are also available to the residents of Allentown, Reading and surrounding areas. If the air conditioning system in your Pennside home is in need of repair or if it suddenly stops working, our trained professionals are able to make repairs to the existing heating system, provide routine maintenance to your AC unit, replace with a new air conditioning system, and repair or install any and all types of water heaters and hot water boilers. If you are looking for air conditioning maintenance in Pennside, Pennsylvania , please call Weidner Energy Savers today! Cooling and heating systems in Bethlehem work hard throughout the year. Families, businesses, and government agencies all depend on having reliable and responsive HVAC systems. Many people do not realize that humidity can significantly affect the operation of any home heating system. Not only that, as a result of humidity interfering with the action of a heating system, homeowners can end up paying a lot more on their utility bills. Weidner Energy Savers is here to make sure that your heating system is in perfect working order. An HVAC system is in part responsible for controlling the amount of humidity inside a home. Too much humidity in the air can lead to mold growth and other problems. Air conditioning helps remove this excess moisture to prevent these problems. However, air conditioning primarily functions as a temperature control system, not a humidity control system; some air conditioners may only remove incidental amounts of moisture from the air. Approximately 60% relative humidity (at 78° F) is often cited as an ideal interior climate achievable with the help of an HVAC system. However, this balance is not ideal for especially hot, humid locations and so additional solutions may be called for. Maximum dehumidification does not necessarily take place during the hottest months of the year; this process can be most important during milder times of year when the air conditioner is not used as frequently. Need Your Bethlehem Heating System Repaired? Call Today! 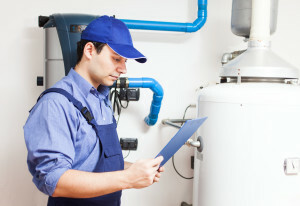 An HVAC system that is well-maintained is going to deliver more efficient, reliable function at all times of the year. Scheduling a maintenance check with Weidner Energy Savers after the months of peak air conditioner use can help ensure that this system provides highly effective humidity control solutions. Our full service heating repair and heater installation needs are also available to the residents of Allentown, Reading and surrounding areas. If the heating system in your Bethlehem home is in need of repair or if it suddenly stops working, our trained professionals are able to make repairs to the existing heating system, provide routine maintenance to your furnace, install a new furnace, and repair or install any and all types of water heaters and hot water boilers. If you are looking for heater maintenance in Bethlehem, Pennsylvania , please call Weidner Energy Savers today! There’s nothing comfortable about being in a cold house during the winter. But this is what happens when your heating system isn’t functioning properly or stops working altogether. While you may be tempted to fix the problem yourself, heater repair in Allentown is best handled by professional technicians. The reason is that contractors know how heat circulates from one room to another. It’s a complex interaction involving the heating unit, the environment and your body chemistry. Specialized knowledge of the three ways heat is transferred ensures your system will be repaired and calibrated correctly. Radiation consists of visible and non-invisible light, such as sunlight. Infrared is another type that involves the transfer of heat from a warm object to a cool object. For example, heat traveling from the ceiling and walls to your body. For a heater repair in Allentown the technician takes that into account during the on-site inspection. Conduction takes place when heat penetrates through solid barriers. 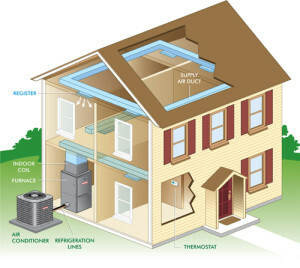 An example is the intense summer heat entering your home through windows, walls and the roof. A heating company in Allentown can determine the conduction levels. By doing so, the service technician can calibrate the heater so it maintains the right temperature for your house during those blistering winter months. With convection, heat is also transferred the ceilings and walls. As the heat rises to the top, air pulls it away and circulates the warmth to the rest of your house. In turn, you feel warmer due to the fact you’re inhaling the hot air while it is also touching your skin. If you’re heating system is broken, restoring it to working condition is not a simple do-it-yourself project. If you need heater repair in Allentown, hire technicians who are well-trained in the science of heat transfer. They will know what to do to keep your home warm all winter. Our full service heating repair and heater installation needs are also available to the residents of Allentown, Reading and surrounding areas. If the heating system in your Allentown home is in need of repair or if it suddenly stops working, our trained professionals are able to make repairs to the existing heating system, provide routine maintenance to your furnace, install a new furnace, and repair or install any and all types of water heaters and hot water boilers. If you are looking for heater maintenance in Allentown, Pennsylvania , please call Weidner Energy Savers today at 215-355-7500! 60 degrees in December? 70 degrees on Christmas? Yes this December seems more like Spring weather, but don’t be fooled! As quickly as the temperatures can rise they can just as quickly fall into the cold temperatures. So don’t fall victim to heater maintenance procrastination. The last thing you want is to come home after a long day to realize that your heater doesn’t work and it is freezing outside. Heater maintenance in Reading can be easy by calling the professionals at Weidner Energy Savers. If you want to take your home ownership duties into your own hands use these helpful tips to make sure you play it safe. Nothing is worse than getting electrocuted. Make sure the power is off before starting any heater maintenance work. Probably the easiest maintenance task even grandma can do. Slide the old one out and slide the new one in. It is important to change these filters every few months (general rule of thumb is once every change of season). The job of the filter is to capture dirt and debris, however some will still make its way through. Take a damp cloth and wipe the insides to rid of the surfaces of the stubborn dirt and dust. When doing this you may have to unscrew the access panel to get to the blower assembly and pulleys and belts. If you want top notch professional service call Weidner Energy Savers for heater maintenance in Reading, Wyomissing, Shillington, Sinking Spring and surrounding. Our full service heating repair and heater installation needs are also available to the residents of New Jersey, including the areas of Burlington, Cherry Hill and East Phillipsburg. If the heating system in your Reading home is in need of repair for the upcoming winter or if it suddenly stops working, our trained professionals are able to make repairs to the existing heating system, provide routine maintenance to your furnace, install a new furnace, and repair or install any and all types of water heaters and hot water boilers. If you are looking for heater maintenance in Reading, Pennsylvania or Burlington, New Jersey area, please call us today at 610-373-5141! Are You Looking For A Reliable Heater Repair Company? Welcome to our brand new website! If you don’t know us we are Weidner Energy Savers, YOUR full service heating and air conditioning contractor serving Pennsylvania and New Jersey. No job is too big or too small for the professionals at Weidner. From routine repairs to first time installations, our trained professionals will provide you with unmatched quality results and products for all residents. We also offer emergency service when you need us the most. Nothing is worse coming home from a long day at work to find out the heater is broken and it is below freezing outside. Since its inception, Weidner Energy Savers has been offering the most affordable prices for emergency AC and Heating Repair Services. At Weidner Energy Savers we provide exceptional full-service cooling and heater repair service to Pennsylvania and New Jersey. From routine repairs to first time installations, our trained professionals will provide you with unmatched quality results and products for all residents in Easton, West Lawn, West Chester, Ardmore, Broomall, Conshohocken, Gwynedd and more! Along with outstanding products and services, we also have the most respectful and friendly team. Our staff is incredibly skilled and highly courteous to homeowners all throughout the Delaware and Montgomery County region. We’re so confident you’ll be pleased with our fast, friendly and professional service; you’ll become a customer for life! Call us today and we’ll show you the Weidner difference! Who doesn’t want to save a little extra cash for the winter? If you are a new homeowner, you may have realized by now that expenses add up quickly. Whether it’s a $200 grocery bill each month, or you need to spend a grand to repaint your living room, you may end up paying more than you intend to. This is especially true if you are relying on an older heating system to keep you warm this winter. A heating system plays an essential role in the functionality of your home. After all, without a properly working heating system, you could be left freezing, huddled up between blankets on a cold snowy night. However, when your heating system is working properly, everything is great! Well, maybe not everything is great. Because, if you are using an old furnace, your heating system could be costing you a lot of money. How do you know if your furnace is old? See if your energy bill has become more expensive- if you notice that your bill has become more expensive than normal; it could be because your furnace is using more energy to get your home to the right temperature. More repairs- stop to think about all of the repairs it has needed over the years. 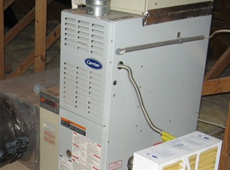 If your furnace is older the 10 years, it may be time to have it replaced. At first you may think it is expensive to have your furnace replaced, but it will cost you more money to keep repairing the old one. Over time, you will be happy that you made the decision to have a new furnace installed. Weidner Energy Savers offers a wide variety of efficient furnace models to choose from that can drastically reduce your energy bill. 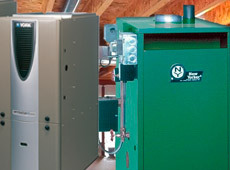 Cut back on your costs by asking Weidner Energy Savers to replace your current furnace.